The new high-definition video camera installed during Thursday’s spacewalk is now in service and providing better external views. Two astronauts are cleaning up after a spacewalk while a pair of cosmonauts are getting a Soyuz spacecraft ready for departure after the Labor Day weekend. On the ground, three new crew members are preparing for a launch to the International Space Station at the end of the month. Commander Jeff Williams and Flight Engineer Kate Rubins completed a spacewalk Thursday, retracting a thermal radiator and installing a pair of high definition cameras. Today, the astronauts are recharging spacesuits and tidying up the Quest airlock by stowing their tools and other spacewalk gear. The Expedition 48 crew now turns its attention to a change of command on Monday, followed by three crew members returning to Earth on Tuesday. Williams will hand over station control to cosmonaut Anatoly Ivanishin before going home the following day with Flight Engineers Oleg Skripochka and Alexey Ovchinin. The trio will undock Tuesday at 5:51 p.m. EDT inside the Soyuz TMA-20M spacecraft officially ending the Expedition 48 mission. After a few hours they will parachute to a landing in Kazakhstan after 5-1/2 months in space. Back on Earth, new station crew members Shane Kimbrough, Sergey Ryzhikov and Andrey Borisenko participated in traditional ceremonies and final qualification exams. They will join the Expedition 49 crew two days after their Sept. 23 launch inside the Soyuz MS-02 spacecraft. 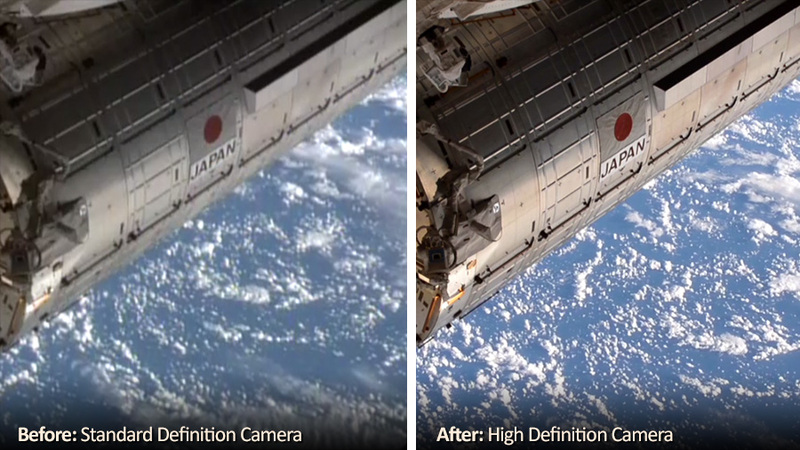 Wow what a difference that new high definition camera makes! The amount of detail you can make out now is insane. You all never cease to amaze me! Keep up the great work and stay safe!